Emmaline is expertly designed to make eating out an elevated experience without feeling stuffy. Photo by Julie Soefer. Emmaline, 3210 West Dallas: As 2017 was winding down, long-awaited Emmaline was just getting started. 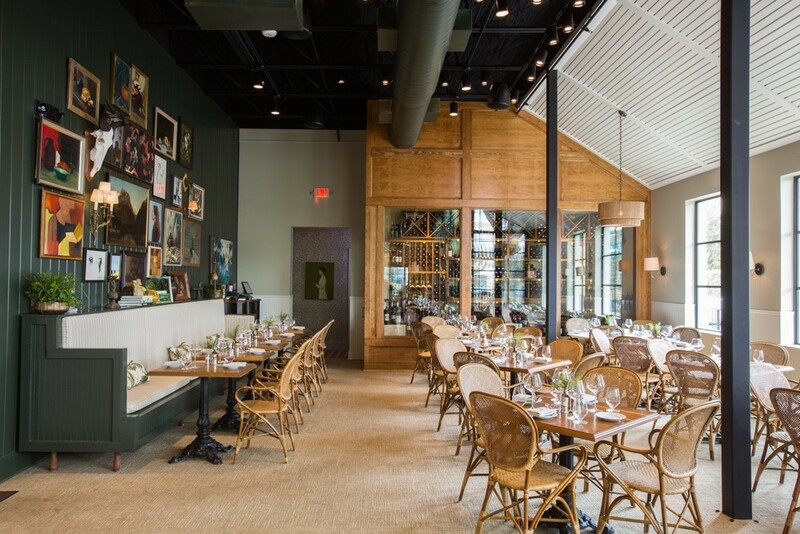 The new Montrose restaurant with a worldly feel and European-inspired menu comes from owner Sam Governale (following his former position as operating partner at Flemings Steakhouse in River Oaks) and executive chef Dimitri Voutsinas. With the help of creative director and designer Ashley Putman, the Emmaline team worked on bringing their vision to life for the better part of a year. A recent visit for dinner proves it was worth the wait. The lunch and dinner menus at Emmaline offer a range of options to suit solo and group dining, with sections that include small but shareable plates, soup and salads, mains, pizza, pasta, sandwiches and side dishes. The extensive weekend brunch menu also offers ample choices. The shareable section—labeled “From the Market” on the menu—establishes the European and Italian influence with fresh vegetables, seafood, and cheese plates. One of the larger dishes, the asparagus and prosciutto, makes an excellent appetizer for a group. Served with a poached egg and vinaigrette, this surprisingly hearty dish really delivers. The asparagus is served in large stalks, perfectly charred and crisp on the outside, yet still retain a nice snap on the inside. Mixed with the egg yolk and prosciutto, the resulting combination makes it a decadent dish worth keeping on the table to savor for the rest of the meal. In contrast to the asparagus dish, one of the lighter options from the “Market” section of the menu is the sea scallop carpaccio. Served in a smaller-sized bowl, this refreshingly light citrus-based dish has a little bit of a kick to it, thanks to pink peppercorn and small slices of jalapeño. 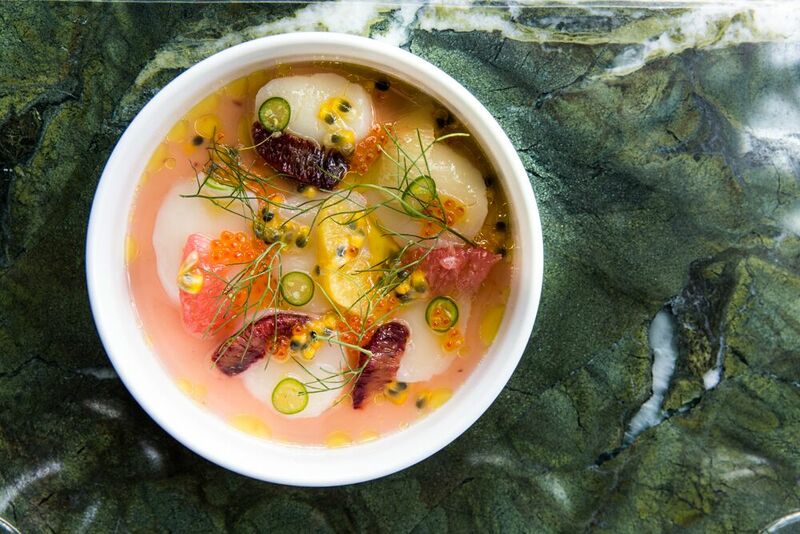 It serves as a palate cleanser—and a must-order for scallop lovers. To round out the small plates, try the oysters and pearls, served with robiola, rosolato and caviar (the “pearls”). Though heavier than the scallops, the oyster and caviar combination mesh perfectly to create a melt-in-your-mouth texture. The only complaint about this dish is that with only three oysters, diners may squabble over who gets seconds. The shared plate selections range from $8 to $18. Sea scallop carpaccio. Photo Courtesy of Julie Soefer. The roasted beet salad with ricotta, hazelnuts and marigold mint is another must. The beets were assorted and fresh, and a mouthful with the ricotta and hazelnut mixed all together make for a delicious combination. Soup and salads selections range from $12 to $15. Emmaline has over a dozen larger entrées, including main dishes, pizza, pasta and sandwiches. Two stellar standouts include the wood-fired cioppino bianco and the fire-roasted lobster and squid ink tagliarini. If you have any trouble deciding between any dishes on the menu, be sure to enlist help from one of the knowledgeable, detail-oriented servers. 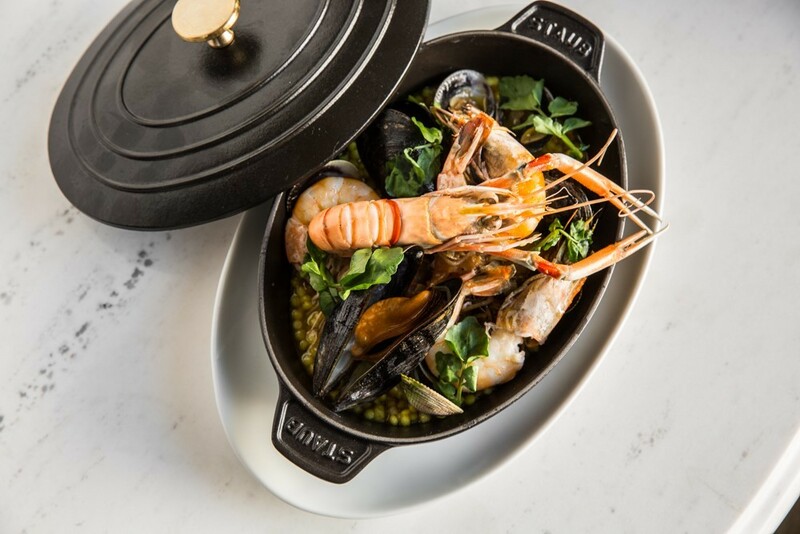 The wood-fired cioppino is a simmering seafood stew made with prawns, mussels, clams, vermouth, tomato, fennel and pearl couscous—and it is perfect for the recent chilly winter weather. The fire-roasted lobster and squid ink pasta is packed with little savory details like charred broccoli florets, lemon chili breadcrumbs and a broccoli purée so tasty it could be served on its own as a side dish. The larger plates range from $15 to $32. The wood-fired cioppino blanco. Photo Courtesy of Julie Soefer. For a satisfying end to the meal, the dessert menu offers six options. If you are looking for something light, the creamyh buttermilk panna cotta adorned with pistachios is just rich enough to satisfy a sweet tooth, but not overwhelming. For chocolate aficionados, the dark chocolate espresso torta with almond gelato won’t disappoint. The dessert selections range from $9 to $12. It’s not often that a restaurant’s surroundings bring as much pleasure as the food, and creative director Ashley Putman’s design makes Emmaline as good to look at as it is to eat in. Stepping inside feels like being transported to a luxurious, upscale country cottage. A formal dining area with deep-set booths surrounds a centralized rectangular bar, and is bordered by a garden room and outdoor deck space so pretty that patio weather can’t come soon enough. 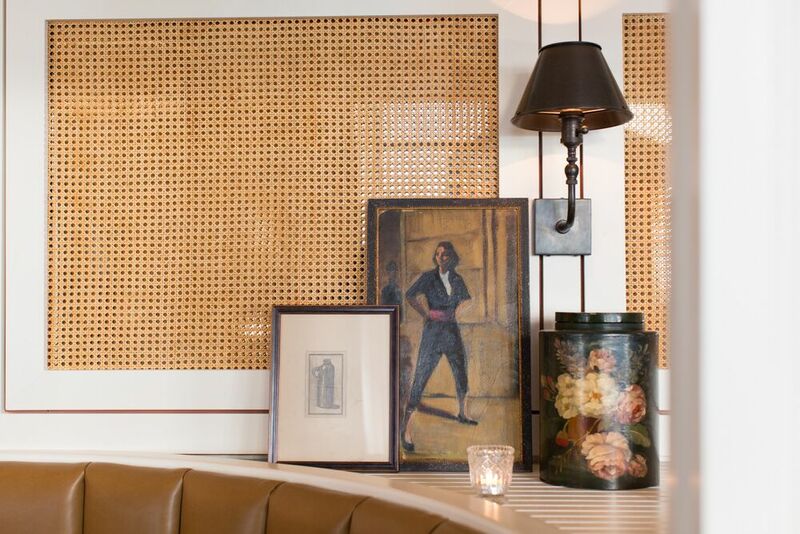 Little touches throughout the space—like vintage accent photos and votives placed between the booths—really bring the décor together and add a touch of personality to almost every corner of the restaurant. Decorative accents make thoughtful touches to Emmaline’s dining areas. Photo by Julie Soefer. All in all, the recent crop of new restaurants in Houston have been knocking it out of the park. As a result, there is no shortage of great places to choose from when dining out. Emmaline undoubtedly deserves a spot in that rotation, so do yourself a favor and give them a visit. Food costs for this opinion piece were entirely paid for by the author and/or Houston Food Finder. Correction note: an earlier headline for this article identified it as a “review,” which it is not. This article reflects an early look at a recently opened restaurant.